According to various reports out of New York, the Yankees have added five players to their 40-man roster in order to protect them from the Rule 5 Draft. 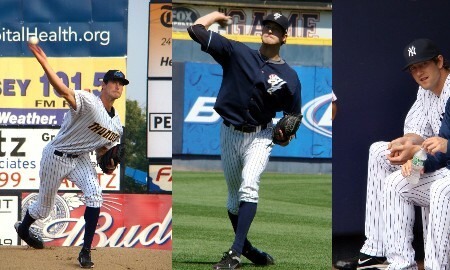 All five have played for the Trenton Thunder. SP David Phelps, SP D.J. Mitchell, OF Zoilo Almonte, 2B Corban Joseph and 2B David Adams were all placed on the 40-man, leaving New York with one available spot for a possible Rule 5 selection or free agent signing without having to designate someone for assignment. Of those 39 players, 23 of them have played for the Thunder, not including a rehabbing Derek Jeter. Of the players who could have been added — and I tweeted this earlier today — Phelps was easily the biggest lock to be protected. 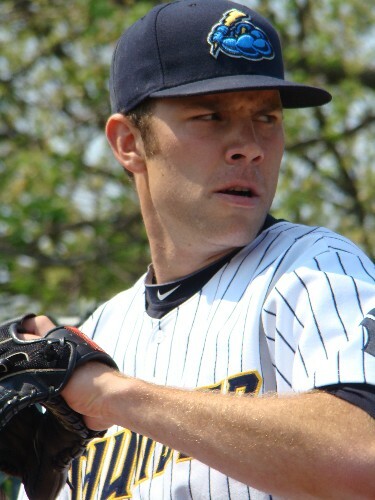 Phelps started for the Trenton Thunder in 2010 before being called up to Triple-A Scranton midway through the season, which is where he’s been ever since. A 25-year-old righty entering his fifth pro season, the personable Notre Dame alum went 6-0 with a 2.04 ERA in 14 appearances for the Thunder. Last year, a season in which he made just 18 starts due to injury, he posted a 6-6 mark with a 3.19 ERA. He has a 38-15 record over in 87 minor league appearances that totalled 496 2/3 innings of work, and a 112:410 BB/K split over that time. He was nearly added to the 40-man roster in 2011, when he was under consideration for a big league start, but the Yankees instead signed Brian Gordon. 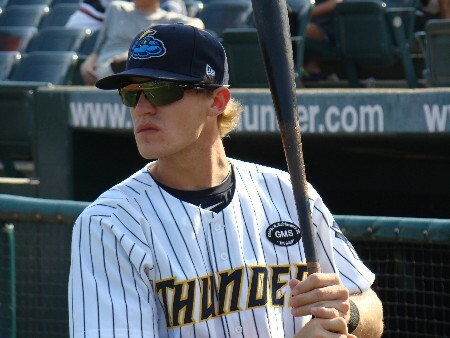 Mitchell will be in his just his fourth professional season in 2012 after being selected in the 10th round out of Clemson by the Yankees in 2008. The 24-year-old righty with the southern accent went 11-4 with a 4.06 ERA in 23 appearances for the Thunder in 2010; 22 of them starts. 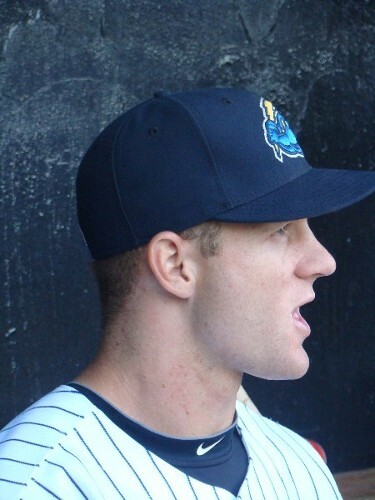 Last season, Mitchell pitched for Triple-A Scranton, and spun a career-high 161 1/3 innings. While he won 13 games and had 112 strikeouts, just like he had the previous season, he knocked nearly a run off of his ERA (from 4.00 to 3.18) and allowed one fewer home run (11 to 10) and one fewer walk (64 to 63) in 10 2/3 more innings than 2010. Almonte is a toolsy outfielder, much like Melky Mesa, who was added to the 40-man roster at this time last year and whom, most likely, he’ll be sharing the Waterfront Park outfield with next season. Almonte joined Trenton midway through last season and never seemed to be able to put it all together. Just 22 years old, the Dominican-born Almonte batted .251 with three home runs and 23 RBI in his first 46 Double-A games, and experienced a marked drop-off in power from the season before (13 HR between Charleston and Tampa in 2010, four between Tampa and Trenton last year). There is still plenty of time for Almonte to develop, and his arm may very well be his most underrated asset. But don’t be fooled into thinking he’s anywhere near big league ready by his placement on the 40-man roster. 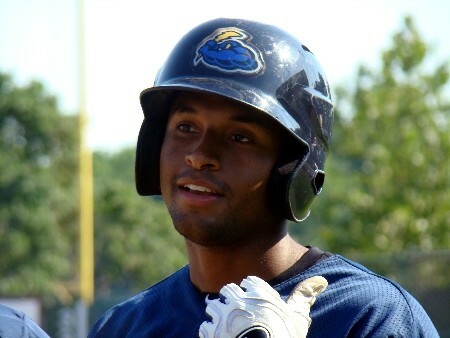 Joseph is a talented infielder who spent parts of the last two seasons in Trenton. 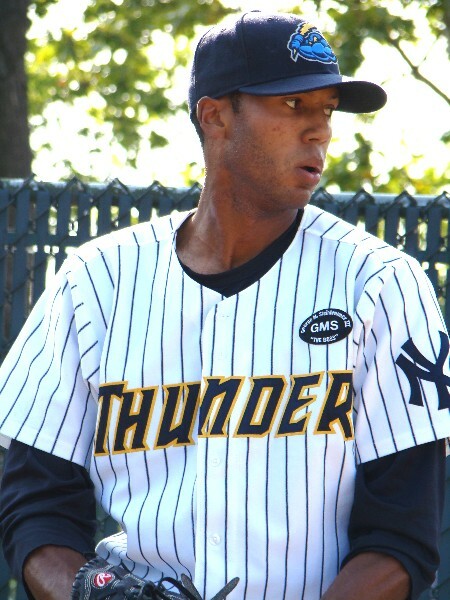 After a disappointing first foray into Double-A — he hit just .216 in 31 games in 2010 while fighting through a wrist injury that ultimately shut him down — Joseph was the Thunder’s everyday second baseman last year, and despite some errors, showed good range and an impressive bat as well. He hit .277 in a career-high 131 games and 499 at-bats, collecting a career-high 51 extra-base hits in the process. Joseph will likely never hit for power, and will need to re-learn the shortstop position at the pro level in order to have a serious chance for a big league promotion. He’s more of a true second baseman and doesn’t profile — at least just yet — as a utility type like a Ramiro Pena. Adams was a strong candidate to be placed on the 40-man roster, but far from a lock. A foot injury has limited him to just 68 games over the last two seasons, including 39 with the Thunder in 2010. Adams played well for Trenton, batting .309 with three home runs and 32 RBI in 152 at-bats before being shut down with what was, at the time, believed to be a minor foot injury. That injury turned out to be a chip fracture in his ankle, and is also largely believed to have nixed a potential deal that would have sent Cliff Lee to the Yankees. Last year, Adams somewhat surprisingly never returned to Trenton, instead splitting a 29-game lost season between the Yankees GCL affiliate and High-A Tampa. He hit .370 in 108 at-bats between the two teams, hitting one home run and driving in 15. But there he is (above), going from Double-A to Triple-A, and then all the way to the big leagues. But, in a stint with the Yankees organization that had far more downs than ups, New York declined his option for 2012, and thus made their former first round draft pick a free agent. Taken 30th overall in the 2007 draft, the Yankees got just 2 1/3 Major League innings of out their big right-hander. All in all, he posted a 15-29 mark in three minor league seasons, with a 5.11 ERA and 190 walks compared to 304 strikeouts in 343 1/3 innings of work. After seeming to make significant progress towards the end of the 2010 season in Double-A Trenton, Brackman regressed in 2011 and struggled for the majority of the year in Triple-A Scranton, leaving many to wonder if he’d be sent back down to Trenton last season, a move that ultimately never happened. But he did make improvements towards the end of the year, rebounding from a horrible June in which he allowed 21 runs in 15 innings to allow just three runs in his final 20 1/3 frames at PNC Field. It were those improvements — which he’ll tell you about in a bit — that led to a Major League call-up and some optimism for a possible return in 2012. But that’s a return that will likely come with another organization. Brackman is an unfailingly nice kid who was always a professional when it came to answering some of the tough questions that his performance led me to ask…but he’s also likely thrown his last pitch in pinstripes, and will need to find another team to take a chance on him. While he always has and continues to have a tremendous upside, he’s slowly running out of time to fulfill his potential. Mike Ashmore: (I spoke with Brackman the day before he made his big league debut…) I don’t know if you read this kind of stuff or hear about it, but there have been a lot of fans saying, ‘Get Brackman in a game, we want to see him,’ and that’s kind of a turnaround from a couple years back when people would say ‘Brackman’s a bust’ and so on. Does that make you feel good or matter at all that people are saying nice things about you? Ashmore: Your performance is obviously something we’ve talked about a lot the past few seasons…you were certainly struggling a lot at times in Scranton this year. We last talked in July, and you were having a bit of a rough patch there. How did you ultimately turn everything around? Ashmore: What you do now…is it exactly what you were doing in college or is it a little different? Ashmore: How difficult is it when people are telling you” try this, try that” with your mechanics and it seems like you know what works for you…you’re going back to your college stuff, which obviously you had before you came to this organization…people are trying to do the right thing for you, but at the same time, has it been difficult with them telling you 20 different things? Ashmore: What’s the goal for you for next season?